Black panne-velvet kaftan with a beaded fringe decoration to the V neckline. Chiffon edges to the sleeves. Lovely smart kaftan for special occasions. Available in a choice of length. 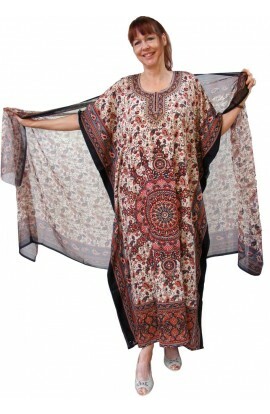 This loose fitting kaftan is generously free-sized and suitable for all dress-sizes between 14 and 30. However, if you would like a smaller or larger version, please send a message or telephone us on 01476 550000. It is available in three standard lengths, but again should you require a shorter or longer length, or even a length inbetween, please contact us to discuss.